Thousands of individuals in the U.S. suffer property damage, serious injury and death every year in parking lot accidents. Many of these accidents are the result of wrongful negligence or an intentional act when drivers are looking for parking spaces or driving in and out of the lot. 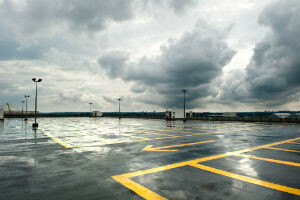 Many victims will file a claim or lawsuit in an effort to seek financial compensation for their property damages, injuries and losses as a result of the parking lot accident. Many accidents occur in parking lots because of the tight corners and obvious obstructions. When the lot is full, drivers have limited visibility and restricted mobility. In some scenarios, unique layouts of parking lots in Rhode Island cause hazardous traffic patterns for drivers, bicyclists, motorcyclists and pedestrians. Many parking lot or parking garage accidents are also pedestrian accidents when a pedestrian is hit by a motor vehicle such as a car or pickup truck. • Was the Vehicle Moving? – If the vehicle is moving at the time of the accident, that driver may be responsible for any injuries, deaths or property damage. • Is It Obvious Who Had the Right of Way? – When two vehicles are moving at the time of the accident, one vehicle commonly has an obvious right of way. This determination is usually founded on traffic lanes and traffic patterns. However, the driver might still be found at fault for the accident even if they had the right of way but were traveling too fast or failed to yield to a hazardous situation. 1. Simultaneously Backing Up – The common scenario where both vehicles are backing up into one another causes a high majority of parking lot accidents. Under these circumstances, neither vehicle is provided the right of way. Determining fault can be nearly impossible even with eyewitness accounts. 2. Pulling Forward Out Of a Parking Space – Striking a vehicle while pulling forward from a parked position usually places that driver at fault for the accident. This is because vehicles moving in a parking lot traffic lane are given the right of way. 3. Backing out and into Oncoming Traffic – Any moving vehicle in a parking lot traffic lane is afforded the right of way to any other vehicle backing out from a parked position. 4. Vying to Park in the Same Space – Attempting to find a parking space during crowded times often increases the chance of being involved in a vehicle accident. This is especially true when two drivers compete for the same space and collide into one another. Usually, the motorists crossing the path of the other driver is more at fault for the accident. However, litigating these types of claims for compensation can be difficult. 5. Backing up to Avoid Oncoming Traffic – In this scenario, the vehicle backing up is the only one moving. These accidents occur when the driver in front stops too far into oncoming traffic at a parking lot stop sign then quickly backs up without looking while striking the front of the car behind them. Police should be called called to write a report for nearly all parking lot accidents in Rhode Island. It is the responsibility of all parties involved to exchange valuable personal information including driver’s license numbers, vehicle registration numbers, insurance policy numbers and contact info. Additionally, the contact information should also be collected from every eye witness. These steps will make it significantly easier to determine which party is at fault when filing a lawsuit or claim for financial compensation. Generally, hiring a Rhode Island personal injury lawyer, a RI car accident lawyer or a Providence auto crash attorney can help resolve the case to ensure you receive adequate recompense for your expenses and losses associated with the parking lot accident. These losses could include property damage, medical bills and lost time away from work. Usually,a reputable RI personal injury law firm or East Providence pedestrian accident lawyers accept these cases on contingency. This means that you can receive legal counsel, advice and representation to handle the claim without paying any upfront fees.